As you may or may not have noticed, I’m a little obsessed with figs right now. I bought a huge box of them at the shuq last week and in addition to the chicken with figs I’ve been eating figs with yogurt and honey for breakfast and grilled fig and cheese sandwiches for lunch. I could eat them morning, noon, and night. But I wouldn’t want to overdo it. 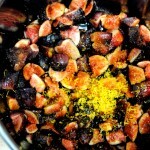 The figs held up well but I wanted to preserve the two dozen or so I had left before it was too late. 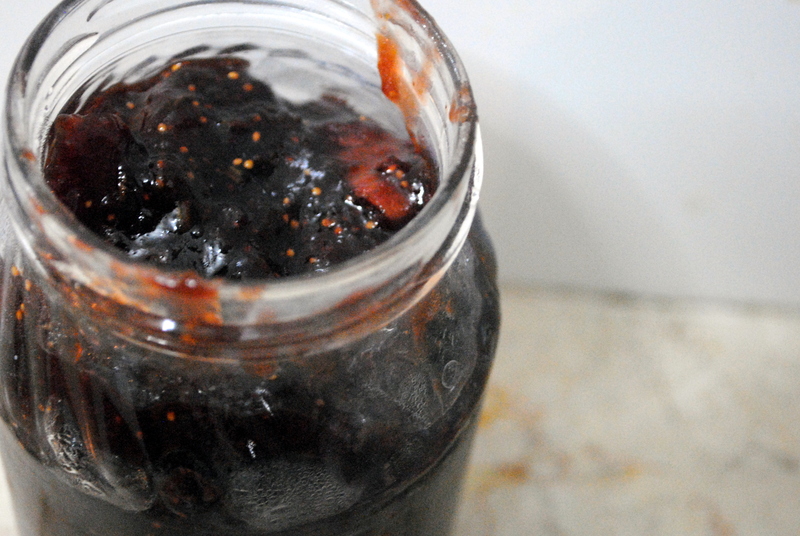 I set out to make fig jam and when my gaze hit the bottle of balsamic vinegar on my counter, I knew it would be a match made in heaven. There were a few recipes online, most of which used way more sugar than suits my taste. I wanted a jam I could eat on peanut butter sandwiches or serve with cheese, something with a little versatility. So I made adjustments and came up with this recipe. When the jam was still warm out of the pan I put it on ice cream; I had to stop myself from getting seconds and thirds. When I first tasted the jam I thought it needed less sugar and more rosemary. The balsamic vinegar here is sweeter than in the States, which may have something to do with it. But tasting it the next day all the flavors melded, the rosemary came into its own, and it was just right. Play with this recipe to suit your tastes. 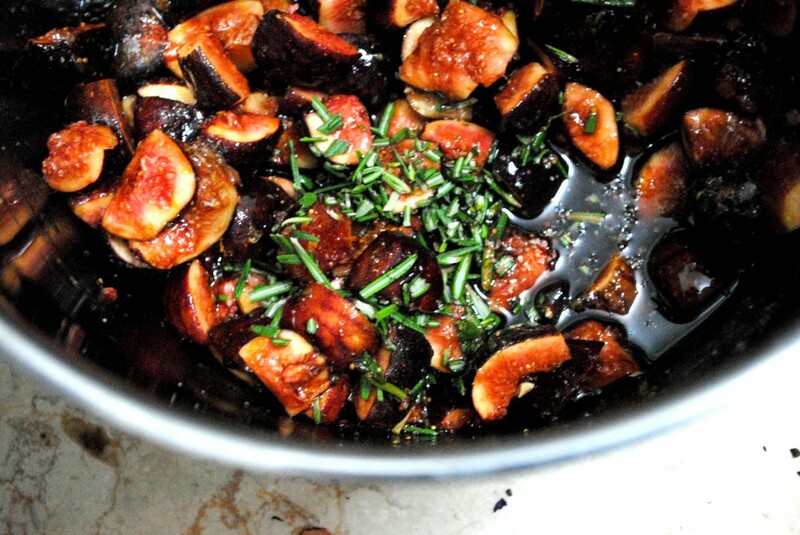 To make simple fig jam just leave out the balsamic and rosemary. Always use caution when canning. If not done properly bacteria can grow in the jars and you can get sick. I went to the extent of boiling the jar but did not go full hog on the canning. Done in this simple way the jam should last three months (if I don’t eat it before then), whereas by canning you can preserve it for much longer. Also a note on the rosemary: it’s one of my favorite flavors and herbs. I can eat it on almost anything and be happy. I am loving the rosemary in Israel, which smells like a cross between rosemary and a Christmas tree. Just lovely. Combine all ingredients in a large pot and let sit for 15 minutes, stirring occasionally, to macerate. Turn the heat to medium-low and simmer, stirring occasionally, for one hour or until desired consistency is reached. Meanwhile boil a glass jar and lid in a pot. When jam is done remove the jar with tongs and spoon in jam. Carefully put the top on and allow to cool to room temperature before refrigerating. The jam should keep in the fridge for up to three months. I can almost taste it, do you think it will work with figs from Citarella? I’ve never canned (jarred?) anything; does the lid suction to the mouth of the jar after it all cools down to room temp? If you use actual canning jars (like the ones at Country Corner) then yes. I simply boiled a cleaned tomato sauce jar and used that. But if you’re looking to preserve the contents longer (this works for jams, preserves, pickles, and more) then you should use the right jars and follow the right procedure. They sell canning kits for cheap that are helpful. 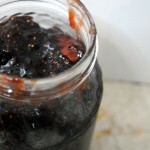 http://www.freshpreserving.com/ has great info on canning and preserving with how to videos and guides. I WANT. bring some home please!!! Made this tonight and it is awesome! Can’t wait to try it with goat cheese and crackers. Almost perfect. I tweaked the recipe a little bit and loved the results. 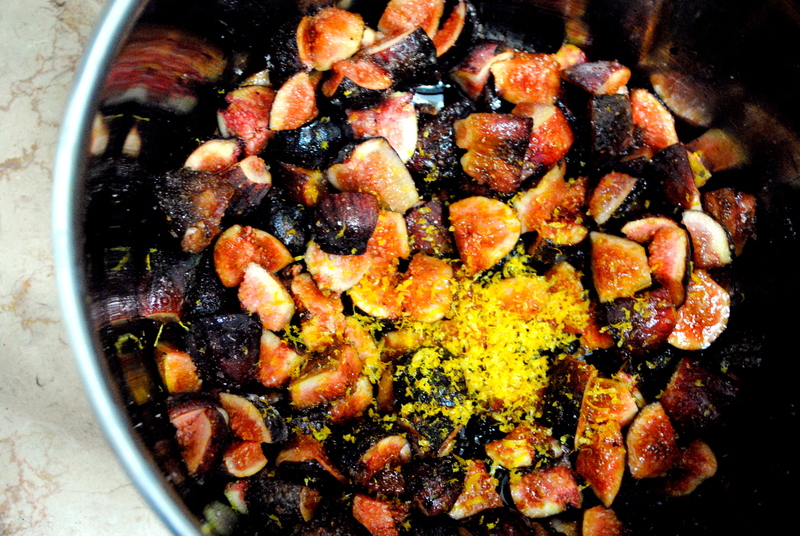 I started with 1 pound of fresh figs, 1/4 cup of minced shallots, lots of fresh rosemary, 2 tbsp of brown sugar and a little brandy. Cooked it for about. 5 hour and then pureed it in the food processor. From there i ladled into jars and further processed them in a water bath. Delicious! Thanks for the ideas.